Milk—it is the first food we eat. In fact, it is the first food all mammals eat. So, it is no wonder that we have a special relationship with the substance. But, what is milk? And, why it being discussed on a Beauty website? fats, lactose, and vitamins, that women and other female mammals produce to feed their young immediately after birth. That’s the simple answer, but milk is so complex that even scientists have not completely unraveled the mysteries of milk. So, what is it doing on this website? Bathing and Milk have almost as long a history as Drinking and Milk. It wasn’t long before people discovered that the nourishing power of milk extended beyond the benefits of drinking. On the other side of the Red Sea, Cleopatra famously took baths in milk to keep her skin youthful. Today, the use of milk in bath and beauty products has experienced a revival. One of the main reasons is that milk and milk-based products naturally contain the same ingredients you find in expensive skin care products. Milk contains antioxidants A, B1, B2, B6, C, D, E, K, Niacin, and Folate. Goat’s milk has receives a lot of attention in the soap market lately because of its higher fat content and because it doesn’t cause the same allergic reaction as cow’s milk. I definitely love it, but I’d like to see another milk-product get the attention it deserves—yogurt! Yogurt and Buttermilk contain alpha hydroxy acid and retinol—the super stars of the skincare industry. I made some yogurt soap a few weeks ago for the Soap Challenges sponsored by Amy over at Great Cakes Soapworks, but life got too busy to share it at that time, so here it is now! I used my all-time favorite yogurt-based soap recipe from Smart Milk Soapmaking by Anne Watson called Yogurt Parfait. “Parfait means ‘perfect,’ and that’s the way this recipe turned out….my recipe testers liked it so much, I decided to feature it,” Watson said. 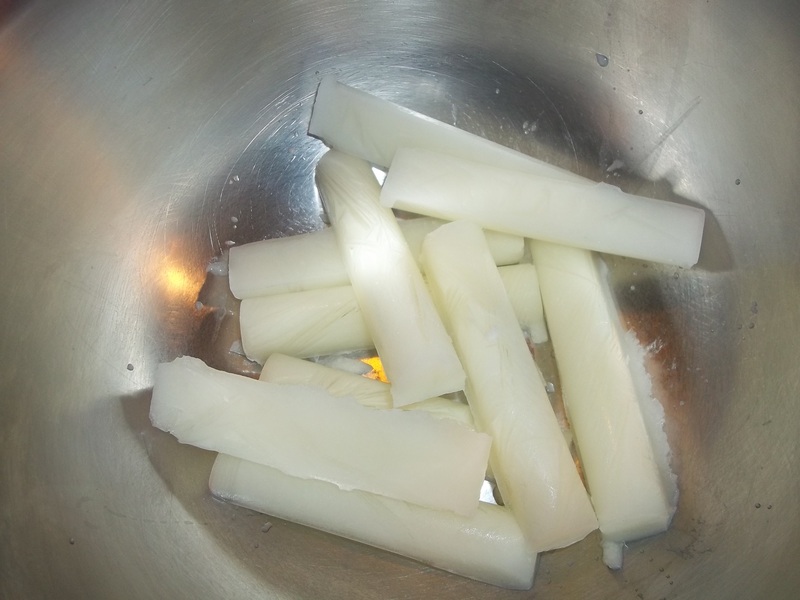 This recipe creates a smooth, creamy, moisturizing, slightly soft bar of soap. To make any liquid milk-based I find it’s best to freeze the milk before adding the lye. This is so that the milk-proteins in the yogurt do not brown or caramelize in the heat of the lye. 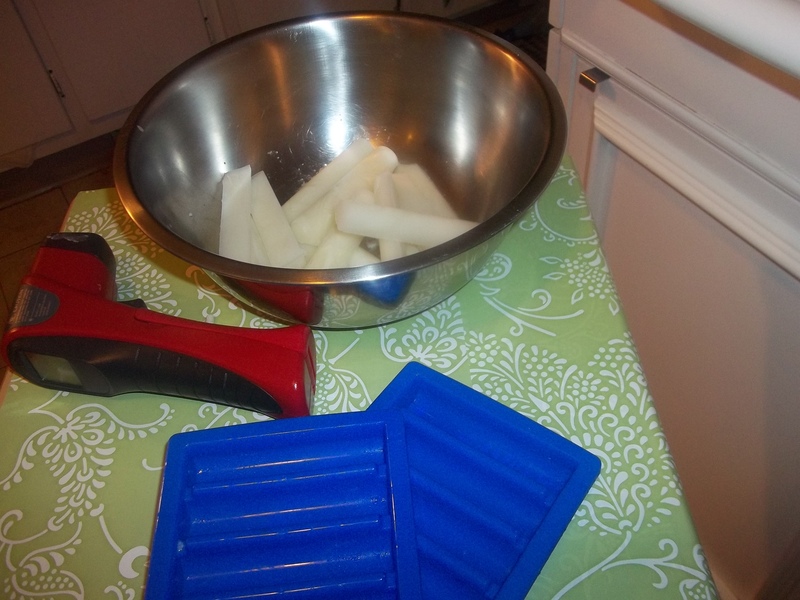 I like to use these long water-bottle ice trays because the increased surface area seems to make the ice melt into the lye better. At a thin trace, I divided the batch in two. In one-half of the batch, I added in the two colors for a swirl. I also added peppermint and lavender essential oils. I love how fresh and clean those two scents are together. The second half went into a plastic mold as an unscented facial soap. I popped everything into the freeze for 30 minutes; this is also to prevent the soaps from turning too dark. Then comes the 48-72 hour wait. After days of work, these are the results. In the end, the lavender and mint soap found itself embedded into another batch of yogurt soap. The facial soap has beautiful Celtic knots on some, and a circle pattern on others. These soaps may look simple, but the yogurt really does smooth and soften my skin. Lovely post! I am so tempted to try the soap recipe this month after seeing your pix! Thanks! It’s a great recipe. I would recommend Smart Soapmaking to anyone interested in soapmaking. If you do try it, please let me know how it turns out!